The Kerala University, Thiruvanathapuram has invited applications from candidates for their UG programmes in its affiliated arts and science colleges and UIT centres for the academic year 2014-2015. The submission of the application forms has already from 14th May while the last date of submitting it online will be 5th June 2014. Those who seek admission with colleges affiliated to the university have to register at the official website www.admissions.keralauniversity.ac.in providing, the name, date of birth, gender, email ID and registration fee amount etc. As soon as the basic information is given, the candidate will be provided with a unique application number and password which could be used for future use. As the application number and password must be used for all the UG online admission related activities, it should be kept safe. The registration process which includes 8 steps can be completed in less time. The various steps include the profile registration of the candidate, academic profile registration, download chelan, entering registration fee remittance details, upload photo and signature, making changes in the form; verify the application and finally taking the print out of complete application form. The hard copy of the online application along with documents should be kept by the candidate and have to be submitted in the respective college at the time of admission. The candidate who has not taken the printout of the application form will not be considered for the allotment while the application of those candidates will be rejected without any notification. The university has initiated to implement the Centralized Allotment Process (CAP) which acts as the best method to give allotments to the various academic programmes offered by the University Departments and affiliated colleges. As the allotment is conducted on the basis of the options submitted by the candidates, the system is simple and transparent giving the candidate an opportunity to choose according to his/her interest. 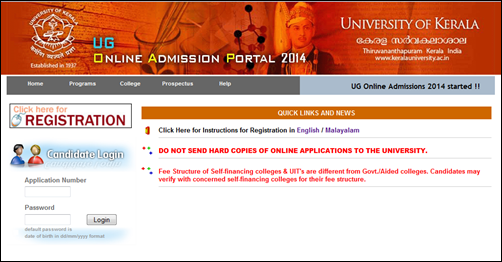 Students who have completed their plus two education and pursue their education with colleges affiliated to the Kerala University, do visit the official website and submit the application form.